Is Google Too Smart for Us? 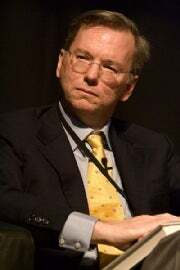 Google CEO Eric Schmidt peered into his crystal ball on Tuesday to share his view of the tech future and - big surprise - it's all about Google. Just shy of predicting flying Google cars, Google's chief since 2001 says in the future we'll never be bored or lonely and cars will drive themselves. Will we all be skinny with perfect white teeth too? mobile devices at lightning speed. It may not surprise you that most of Google's mobile services already use remote computer services (often called "the cloud") to help you access Gmail, Google Calendar, and Buzz when you're on the go. A more recent example is Voice Actions for Android, a very cool app for Android 2.2 phones. In the Google of the future, you won't need to type in queries, the search engine will just know what you need and deliver the results. When you are walking down the street, for example, your mobile device will send you an alert when you are in close proximity to something you might be interested in. This type of functionality is, in fact, already here to a certain degree. Open the Foursquare app on the iPhone, and you'll be alerted if you are near a restaurant or business offering Foursquare partnership deals. You can use Google Buzz or Maps to find businesses near your location. Casio's forthcoming EXILIM EX-H20G will deliver an alert when you are near notable tourist attractions while on vacation. The Google of the future will also be able to parse the meaning behind your search queries. If, for example, you ask Google for a weather forecast, Google will understand that what you really want to know is whether to wear a raincoat or water the plants. Schmidt and Google have forwarded the idea before that Google will one day try to figure out the intentions behind your search and not just deliver results based on your search terms. The company's biggest experiment in predicting search queries so far is Google Instant where search results and query suggestions change as you type. The new service supposedly shaves off about two seconds from every search query. But as PC World contributing editor Harry McCracken points out Google Instant still needs a lot of work before it will accurately predict what you want to find. Turning a computer into a virtual secretary has been one of the many holy grails of the technology industry. Apple's 1988 concept video of the Knowledge Navigator, a digital assistant that can converse with you, is a prime example of this. In Schmidt's future, technology would be able to make sure you're never bored by delivering streams of content from the Internet. Computers would also help you be more productive by accessing your schedule and to do lists to let you know what you need to do next in your day. Of course to do this, you would need to share with Google your e-mails, contacts and personal network of relationships, as Schmidt explains. Some of this technology we already do, with examples being YouTube leanback, Google's Priority Inbox, Google Buzz, automated calendar alerts and digital task lists. But why stop there? Schmidt's vision sees an even deeper integration with computers surfacing pertinent information to you automatically and unprompted. How about GPS technologies that pinpoint your location to within a few inches so you will never be lost. As for getting around town in the future, Schmidt said, "your car will drive itself. It's a bug that cars were invented before computers." Schmidt's talk was interesting and the seeds of what he was talking about are already here. The Google chief was also careful to say that none of this type of assistance could be done without express permission to index your data. It remains to be seen whether people are ready for an even deeper integration with Google services and for computer's to start telling us what to do. Hopefully our digital overlord Google will always be a benevolent dictator.